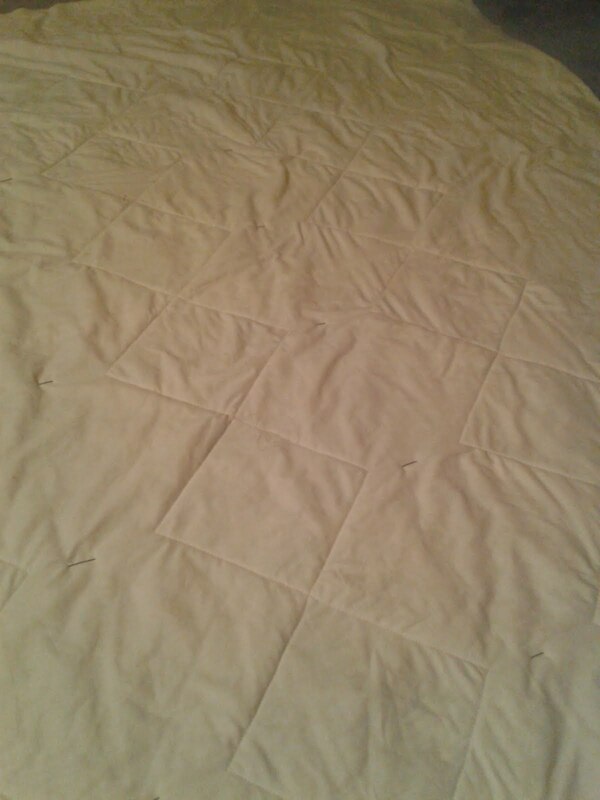 I must say that all the comments on my last post have been brilliant in helping me make my mind up about quilting Mum's Quilt - so thank you very much indeed! When I posted the photo it was 'unclickable' (is that a word?) so you couldn't enlarge the pic to see the daisies that I was not happy with in all their messy glory. So here it is again, just so you can feel superior - don't worry, it is my mission today to make everyone feel better about their own FMQ! Tee hee! Thank you to Mrs P, Donna and Reenie who valiantly stuck up for the daisies - but after a lot of thought, I really didn't think that they passed muster and so out came the damn unpicker. Again. Elizabeth made me realise that the daisies were quite rigid and stylised, when they should be natural and flowing - after all, the daisy chains will be, so daisies in the blocks should be too. Mind you, looking at Elizabeth's quilting, she's a natural doodler with some lovely designs squiggled out on her various quilts (look at her Peppermint Burst quilt here). 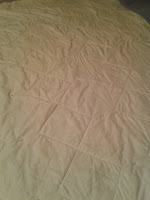 Then dear Bilbo emailed me with a blisteringly good suggestion - "Whilst you are deciding upon a different motif, one of the things you could do is stitch in the ditch along the seam lines to stabilise the whole quilt and this will vastly improve the overall appearance of whatever you put in each block." So here is the stitch in the ditch around the blocks (from the back - can't see any difference on the front! Then a smaller, doodled daisy. I like it - now we're getting somewhere! 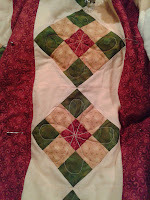 The quilt is looking great! We are our own best critics; however, when we just aren't satisfied we just aren't ready to move on. Happy quilting! I like it much better, too. Looks gentle and pretty. I think it's one lovely quilt. Oh but you will, kiddo, you will when it is all finished. BTW, if you cannot see your SID on the front then Big Pat On The Back because you shouldn't see the stitching. That's why the call it IN the ditch rather than ALONGSIDE it! Well done you. 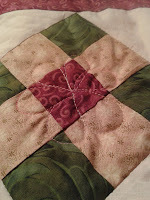 I know a lot of quilters don't like SID because they think it is either difficult (it isn't) or it's not worth it because you can't see your stitching when it is done (you shouldn't be able to!) but it really makes so much difference to the finished quilt; makes me sad when I see a beautifully pieced top but the quilting lets it down. OK, so I was going to say several things, but Bilbo's said them all! Aw, I love the change in the daisies. Great change, they are so charming now. 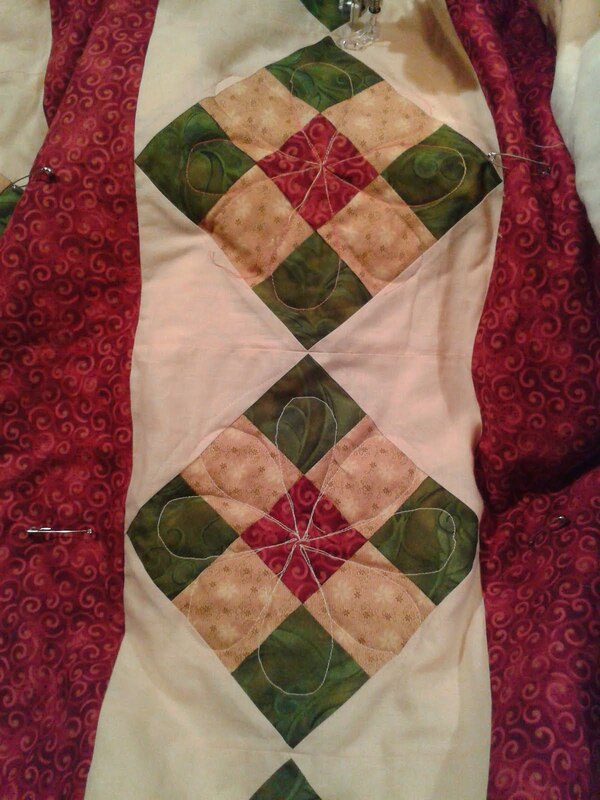 I can really see your quilting coming together on this quilt. Two thumbs up. I'd give you more but I don't have them. well then don't listen to me...LOL I agree with everyone else about not being able to see you SID. I still think it all looks great! You're right, Donna - if you ain't happy in your own mind, it's not working! Thank you, Joanna - the doodled daisy is less formal so more forgiving with a stray stitch or two! You continue to be full of excellent advice, Bilbo - thank you. She's good, isn't she, Sue! Thanks, Elizabeth - I'm happy with this now.